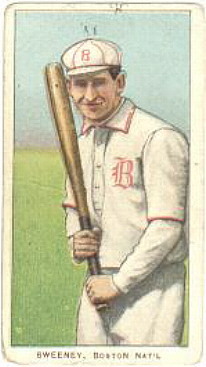 T206 Bill Sweeney (Boston) No "B"
For many years, checklists of T206 carried the T206 Bill Sweeney "no B" card as a variation - a rare and costly variation. It was gradually realized, however, that the card was merely a printing error. The magenta ink which would have applied the "B" crest to Sweeney's cap and jersey and the piping to his collar and sleeves had never reached the cardboard, either because the ink font ran dry or something got between ink and cardboard. 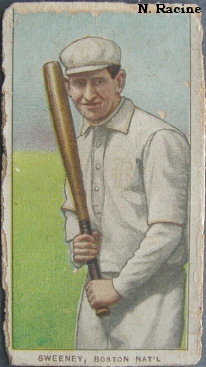 Logic dictates that other cards on the same press sheet as the "no B" Sweeney are also missing the magenta ink, but because of the particular placement of that color, it may be difficult to detect the error. Moreover, there were a few other "missing magenta ink" specimens have been found recently. They are Johnny Bates, Tris Speaker, Fred Beck, Vive Lindaman, Beals Becker, Heinie Wagner. All of them are from Boston.